Brief Blurb: Asleep at the Reel evoke the sound of the lively Irish pub, of flying fiddles and rich voices in harmony around an open fire. Their songs are stories – some of them hundreds of years old – wrapped up in music. Their rollicking jigs and reels will keep your feet tapping. The Irish call it the craic. It’s a word that means music and fun and good times and, typically, quite a lot of the demon drink all bound up together. 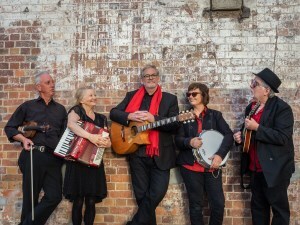 Asleep at the Reel join the dots between Celtic music and contemporary Australian song, courtesy of nationally acclaimed songwriter Mark Cryle. They take this Celtic blend from its roots in the peat-smoked pubs of Ireland and Scotland, from the kitchen, the hearth, the veranda and the shearing shed all the way to the stage. There they throw in a little backbeat just for the fun of it. With special guest Hugh Curtis on fiddle and mandolin.